Our attention has been called to a misshapen old pine tree that rears its head on the avenue west of the Greenwich Trust Company's land [240 Greenwich Avenue]. Without form or beauty, its limbs blackened by age, it has the appearance of a wraith from a primeval forest. While it has its own story it cannot be classed among native trees. Our forests never produced white pine trees and this is one of that variety. Going back more than 60 years, the spot occupied by the old tree was on the farm of S. Merwin Mead. All the territory from Greenwich Avenue west to the high school lot and beyond and south to the railroad was given over to cultivation of grain and hay. It was the nesting place of the merry bob-o-link in the month of June and in winter down the slope and across what is now the athletic field was a safe and popular coasting place when snow was abundant and lasting. Joseph E. Russell lived on Grigg Street in a house of his own design and it is still standing, although recently it has been absorbed by an apartment house with a brick front. Its peculiar roof construction was a sure identification. In the spring of 1868 Mr. Russell had an ambition to move up town. With that end in view he bought for $1,000 an acre of that portion of the Mead farm fronting on the west side of the avenue. And by way of a house he stated that as his own architect he would build a house unlike any other in town. And he quite well succeeded. The house still stands on its original foundation, but a row of commercial buildings in what was his front yard conceals somewhat the architecture of the old house. There was no attempt at jigsaw embellishment so common in those days but it was likened to a flour mill or a factory community house. However, it suited its owner and made a comfortable family home for many years. In Mr. Russell's endeavor to beautify the grounds he set out two Norway spruce trees in front of the house and a couple of white pines in the rear. The survivor is one of the pair and it exemplifies the futility of planting foreign trees in Greenwich soil. In a few years those trees had a somewhat disconsolate look as their needles shrank and their limbs took on an unhealthy tinge so different from the appearance of white pine in Maine or New Hampshire. Had a single elm tree been planted there in ground that is never dry, for many years back in the future it would have been a joy to those who appreciate such great trees as the one that stands in front of the town hall. But such a mistake is being made every day. Foreign evergreens in the brilliance of their youth as decorations near and around a house look well but should be renewed every four or five years. As a hand-down to future generations and as a delight within 20 years, the elm or the sugar maple should have been chosen. This rather unexpected reference to the Mead farm recalls its owner and his homestead, still standing but so well concealed by what may be termed dooryard stores that few know of its existence. Standing on the sidewalk in front of the Mead Stationery Store or the Electric Light Company's office the peak of the roof is seen. Br. William Burke now owns the house as well as the abutting stores. The house was built 122 years ago and excepting dormer windows looking south is in its original form. It was built to last for generations and for the period was quite a mansion. When it was erected the avenue was only a country road 18 feet wide terminating in what later became Steamboat Road. From its front porch it had a grand view of the Soung extending well to the east while the view down the road to Piping Point, unobstructed by the present railroad embankment, was a nearer view of the harbor and Capt. Daniel Merritt's landing. After the railroad was built (1845 to 1848) and several years later those who had settled in that part of town abolished the old name of the road and gave it the present name of Arch Street. To the young reader that name may seem inapplicable, but the original railroad embankment was pierced by an arched tunnel of stone which gave way to the present iron bridge when the four tracks were laid in 1892. The Merwin Mead Farm, consisting of about 150 acres, extended east to Davis Avenue. Most of Locust Street and a portion of Milbank Avenue were opened on that farm. It also was bounded by Greenwich Avenue, and Mr. Mead opened the road on the farm connecting Greenwich Avenue with First Avenue, now called Milbank Avenue. He was one of the most public spirited men of his generation. The roads that were laid out through the farm represented his contribution to the public improvement and he never asked asked for land damages. The road just mentioned he called Elm Street, a name that no one has attempted to change. Mr. Mead also set out the elms along the easterly side of the avenue from the town hall to Em Street. But those trees have disappeared with the change of grade 30 years ago. Source: The Greenwich Press. 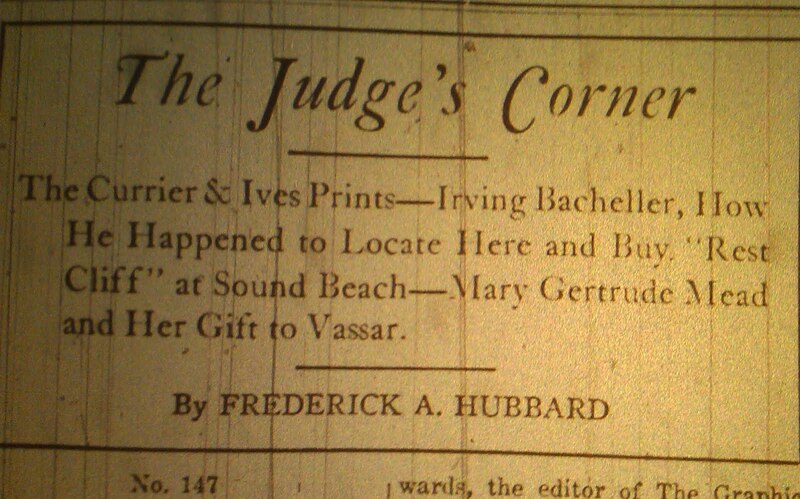 Thursday, January 29, 1931. Sixty years ago a beautiful young lady lived in the Frederick Mead homestead, then standing on the corner of Putnam Avenue and Milbank Avenue. The streets then had other names. They were Main Street and the "road to Davis Landing," sometimes called "Love Lane." The house built in 1856 has been moved farther down Milbank Avenue and is unchanged except that by the change of location it has surrendered its former Sound view. Merry Gertrude Mead was the only daughter of Frederick Mead, a wholesale tea merchant and of the son of Dr. Darius Mead of Putnam Hill, who so long and so faithfully served the people of Greenwich as their much beloved family physician. 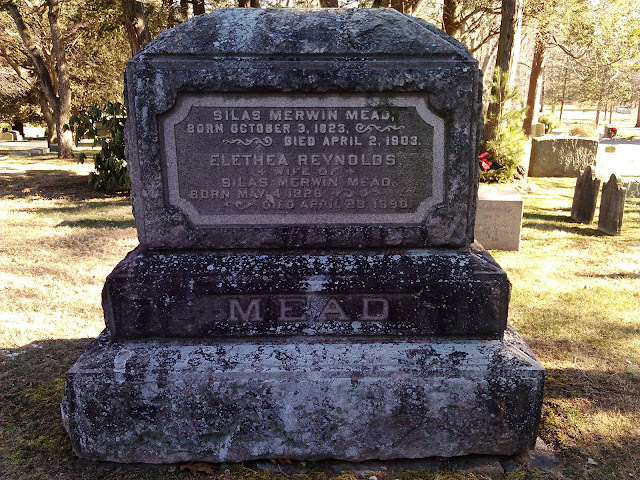 Fred Mead, Jr., whom so many other readers remember, was her eldest brother graduated from Yale in 1869. His sister's graduation at Vassar took place the following year. She was much devoted to astronomy as taught by Maria Mitchell of Vassar. And she installed an expensive telescope in the upper story of the homestead. After her graduation we saw less of her. She wrote a story published by Charles Scribner in which were depicted many of the local rural scenes of the period. She traveled abroad and made lengthy stops in London, England, which, by the way, happened to be her native country. And finally she married the famous artist, Edward A. Abbey, who created with his brush in the Boston public library, the much admired "Search for the Holy Grail." 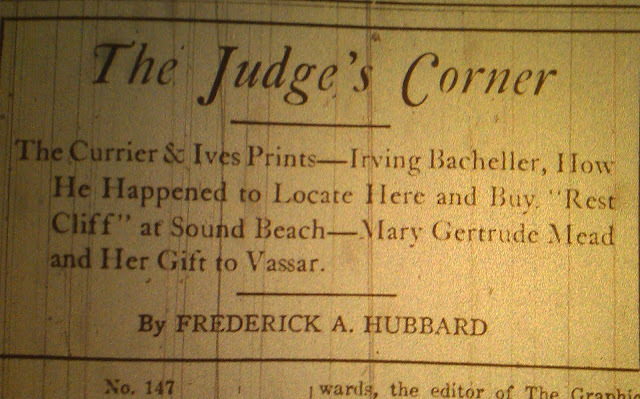 Now she comes into notice again as the giver of a memorial fund to Vassar College. The interest on this fund which is not new has been devoted to the botany department of the college and has made possible the establishment of the Dutchess County Botanical Laboratory, in which plants are arranged according to societies rather than families and where more than 600 plants and trees, out of a possible 2,000 varieties in this country, have already been procured. These facts appeared at a dinner last month at the Alumnae House, which was the scene of a gay assembly. Thus it is that the money and the generosity of the original Greenwich stock have their share in the establishment and maintenance of many worthy public objects.